JCI - Knock your SOCS off! Citation Information: J Clin Invest. 2005;115(2):233-236. https://doi.org/10.1172/JCI24228. The growth hormone/IGF-1–signaling (GH/IGF-1–signaling) system is involved in numerous physiological processes during normal growth and development and also in the aging process. Understanding the regulation of this system is therefore of importance to the biologist. Studies conducted over the past decade have shown that the JAK/STAT pathways are involved in GH signaling to the nucleus. More recently, evidence has been presented that a member of the SOCS family, SOCS2, is a negative regulator of GH signaling. This story began several years ago with the dramatic demonstration of gigantism in the SOCS2-knockout mouse. A more specific definition of the role of SOCS2 in GH signaling is provided in this issue of the JCI by the demonstration that the overgrowth phenotype of the SOCS2–/– mouse is dependent upon the presence of endogenous GH and that administration of GH to mice lacking both endogenous GH and SOCS2 produced excessive growth. 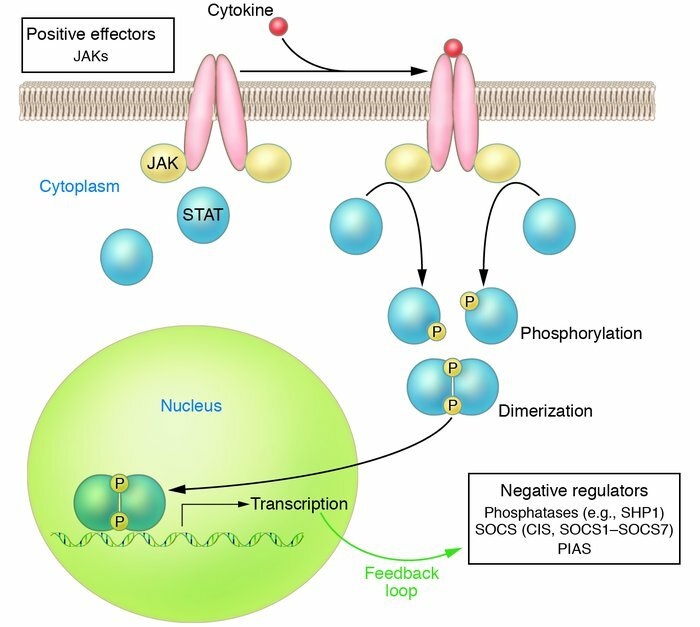 Model of JAK/STAT signaling and negative feedback by SOCS proteins. Cytokine signaling involves ligand binding and activation of the cell surface cytokine receptor. Recruitment and activation of JAK in turn facilitates phosphorylation of a STAT tyrosine residue, and subsequent STAT activation induces dimerization. This activation is tightly controlled by multiple negative regulators of phosphorylation such as phosphatases, SOCS, and PIAS. SOCS proteins are also induced by cytokine signaling and form a closed-loop, negative-feedback mechanism.